This has been such an odd little year. I got A Pius Legacy and A Pius Stand published, finishing out the trilogy I began with A Pius Man. I joined in a few political fistfights, mostly having to do with women in books for some reason. I've had fun with Marvel, both Captain American and Agents of SHIELD. I've cast my other book series, and got a book publisher. Yay. I reviewed books all over the place. Like Amy Lynn, and Night Machines, and a bunch of others here and there. I've been at the Catholic Writer's Guild, and had some odd times there. And then there's my job at American Journal.... fun fun fun. I've looked at tv and video games and a whole bunch of other stuff. Thankfully, I haven't lost a whole collection of authors, like last year. I want to thank all of you for making this such an interesting year. And here's to 2015, and selling a ton more book. You know, with all the posts yesterday, I can't believe I forgot this one. I did a guest post over at Steph Souders' page. 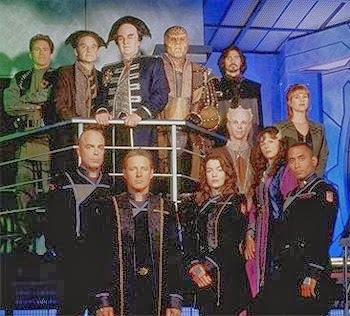 It's all about Babylon 5. When Sean AP Ryan is hired for Black Friday security, he figures it's an easy gig. He should have known better. 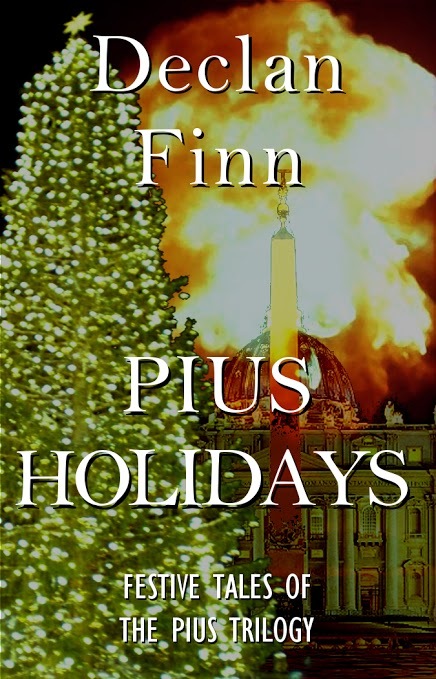 Sorry, but this is now released in Pius Holidays. Or, in the complete Pius Tales. This is a continuation of my post on why Die Hard is such a perfect movie. I suggest starting there. Every line in the movie adds to the film. Nothing is wasted. And if there is something, I can't see it. Yes, there's a reason I'm not breaking this up, mainly the dialogue feeds into both the character and the plot ... and because character adds an extra dynamic to this plot. The first scene alone does so much, it's stupid. Remember, the scene is John McClane talking to the passenger next to him on an airplane. It gives him a reason to be shoeless during the movie, and establishes his profession, and is already adding to his character by both giving us his CV in a smooth, effortless way. It establishes his anxiety about flying, giving him a cute character trait. Also, it already shows us just how much of a smartass he can be... McClane's shoeless wardrobe "choice" in the film leads into a brilliant, brilliant moment that deeply hurts him later on. We've already covered how the Rolex adds to the plot, and that was all covered in three lines of dialogue -- it both underscores Ellis' pursuit of Holly, struts it before John McClane, and dangles this metaphorical gun in front of the audience's face without anyone realizing how integral ANY of it actually is. Ellis, who has few lines in the movie, serves many functions. One, his presence gives a counterpoint to McClane's actions throughout the film -- no matter how many gunman McClane takes out, he's still only one person. Ellis is one of the many realists in this film, but the only one who is among the hostages. Ellis' strutting egomania, his coke problem, and his focus on Holly all culminates in the pinnacle of his arc. His egomania and his drug problem drive him to try and negotiate with Hans and company -- he thinks he can talk them down, give them what they want, and they can all go home. And while he gives them McClane's name and occupation, Ellis makes it a point to spin the story that he brought McClane to the party, and there is no mention of Holly. For such a minor character, Ellis provides a lot.... even though giving up John's name will eventually lead to Holly. And his death is one of the few things that hurts McClane. And that's a secondary character. Maybe even tertiary. Dialogue establishes a lot in this movie. It establishes Mr. Takagi's character and backstory with Hans' first speech, and adds an emotional blow to Takagi's death. The offhand lines about needing the FBI, and "it's all part of the plan" feed into the turning point of the film, and a mystery that is on par with any twist by Mission: Impossible, Leverage, or Jeffery Deaver. 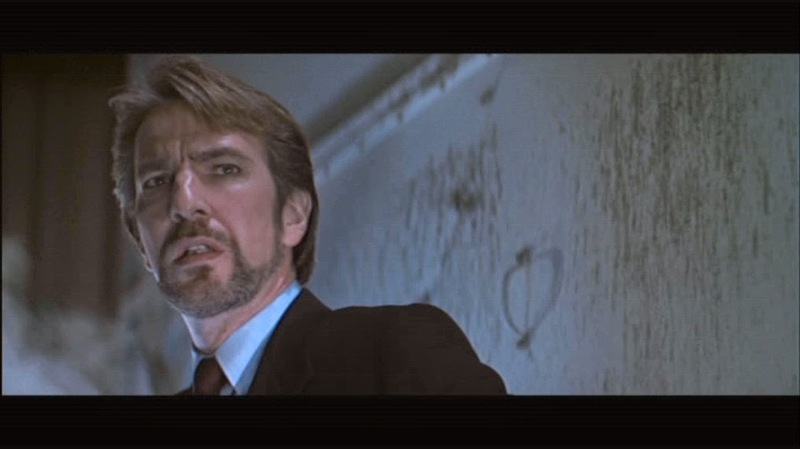 In fact, I would say that Deaver was warped by Die Hard. A lot of things in the second half of this movie are almost perfect mirrors to stuff from the first half. The conversation between John and Holly in (what I think is) her private bathroom leads directly to a conversation that is the turning point of the film... which is also in a bathroom. McClane is at his lowest point. He's been wounded physically and emotionally. It's the flip side of the earlier conversation with Holly, and while it's depressing, it has a point, and also accomplishes much. McClane's relationship with the LAPD Sgt. Powell, outside of the building comes to a head, and it leads directly to the punchline. And there are aspects that are not major, massive plot points, but are little things. It was Michelangelo, I think, who said that trifles make perfection, and that perfection is no trifle. In the case of Die Hard, it's the small things that add a surprising amount of character to people who serve some very basic functions. Heck, just look at the character shown in Hans' merry band of killers, and the LAPD, who are most assuredly the most basic part of this endeavor. For example, look at "Karl." He's the Bond Villain sidekick of this film. But the first time we see him is carrying a chain saw, about to cut the phone cables for the building...and he's competing against another gunman, who's trying to either bypass the alarm for the building, or cut the phone system via a more elegant, less brutal fashion, I could never tell. But you could tell from that scene alone that the two gunman are brothers, and that the death of the younger brother by McClane (the first gunman he kills), drives Karl throughout the film, giving him solid reasons for actions that are detrimental to Hans and his plans. Then there's the terrorist who sets up shop in a confection stand, bringing out piles upon piles of gun magazines .... and grabs a candy bar. Then there's Theo, the Hacker. Who gambles, likes sports and sports analogies, and takes his computer job seriously, yet treats everything else with a sense of levity. He's dour and serious about breaking into the computer and the building's vault, but cracks jokes as he coordinates the gunmen to shoot and blow up a bunch of cops. And then there's the chauffeur, Argyle, whose presence in the film is almost comic relief -- whether we're laughing at his obliviousness to the situation, or his line to the stuffed animal to "shut up," and even his little victory over Hans' hacker. Obviously, I can go on forever about this movie (as though I haven't already), but let's face it, it's a good film with lots of little things thrown in that make it a great movie. Notice, there are a whole bunch of things I didn't mention that are also writing moments. 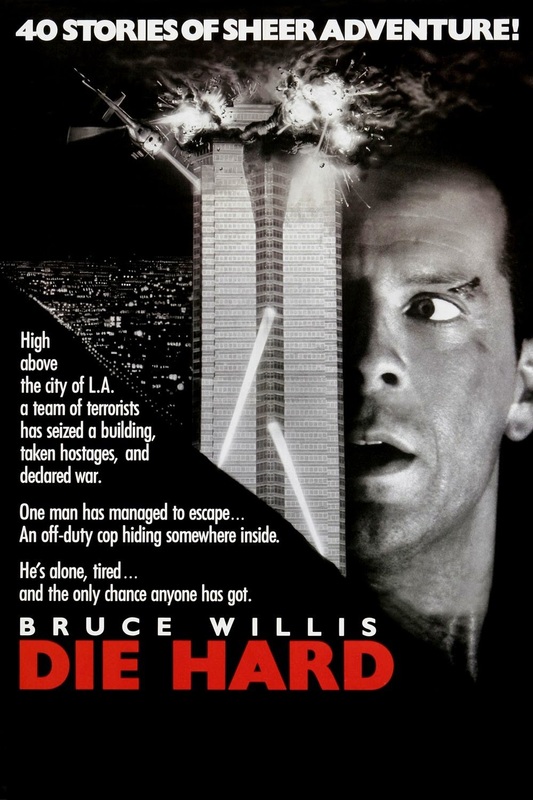 How Die Hard also has elements of parody, going after both the media and the FBI. There's a lot here, but this article is almost two thousand words long already. Though I think there's no denying that Die Hard could be used to teach writing classes. I've been meaning to do this for a while now, but Die Hard is a perfect movie. Seriously, perfect. From almost every angle. Writing-wise, it's a textbook marvel of how to write. Cinematically, it's perfectly shot. Acting wise, it's pitch perfect. Let me show you what I mean. At least writing-wise. I'm not sure I'm good enough to do this for cinematography, but I may give it a shot later on. I started writing this expecting to go over everything I mentioned, but I may not be able to. There's a LOT to cover in one topic alone. In fact, I'm going to break up this blog into two parts. Maybe three. 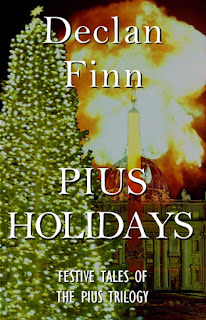 Also, there will be a Christmas short story launching today: Deck the Maul. In German: "Karl, schieß dem Fenster." ".... and father of five." "I'm going to count to three. ________ there will not be a four." "Rumor is that Arafat buys his there." "What kind of _____ are you?" "Who said we were ______?" "We're going to need some more FBI guys." "I don't want ______ I want dead." "HHHHHHHHHHHHAAAAAAAANNNNNNNNNNSSSSSSSSS. Why'd you have to __________?" "That man looks ________." "He's alive. Only John _________"
And, of course, "Yippie Kay Yay, _________"
We all know that. However, what I mean is how well the Gun in Act One is utilized. Don't know what I mean? Also called Chekov's Gun. It's been ten years, two agents, three friends, and dozens of rewrites. There's nothing more to say. So, yeah, this won't be a long one. 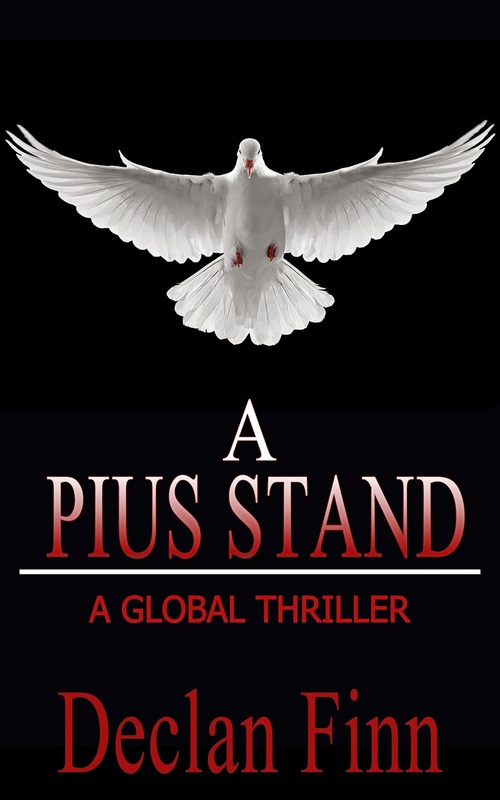 As of right this minute, A Pius Stand, A Global Thriller, is published, marking the end of The Pius Trilogy. What's the premise? you ask? Well, how does this look to you? 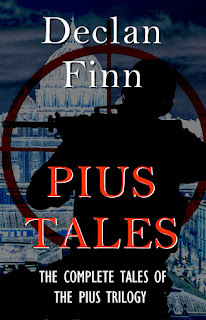 A Pius Legacy asked the question: What happens when someone kidnaps the Pope? When you're Sean A.P. Ryan, security consultant, the answer is easy: get him back. And that rescue pissed off...everyone...and the entire United Nations declared war on the hundred-acre Vatican city. When the Pope is threatened by the international community, with no help in sight, what's a Pontiff to do? Run and hide? With offers coming from all over the world, it seems like the best course of action. With fifteen-thousand men from armies all over the world coming to end the Catholic Church, it's a threat not even the Pope's bodyguards could handle. But it's not just about Vatican City. With the Church all over the world in peril, things are not as clear cut for Pope Pius XIII as one might think. With the forces of darkness closing in, Pius, Sean, and the people they love must make a decision that will affect the lives of billions, and threaten all they hold dear. 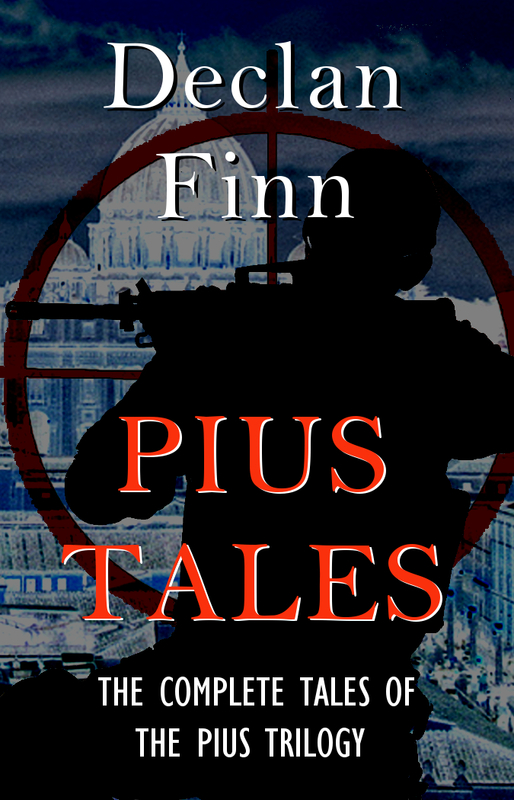 Do they leave the Vatican to their enemies, or stay, and face certain death? Once more, this epic conclusion to The Pius Trilogy continues to mix real history with wholehearted adventure. With everything on the line, and no good outcome, the Pope and his champions must decide to either cut and run, or to make a final stand. If you're waiting for your copy to arrive, put on your headphones, turn up the volume, and enjoy the trailer below. Why? Because this is war. Some days, I get really tired of Christian writers who set out to write a story about a faith-related issue, and the results are so heavy-handed, I feel like I've been back-handed. You know what I mean, a story that's so entirely centered on the Christian message, and yet doesn't have any breathing room for the story and the characters to develop beyond that. The problems a lot of these types of books have is that, well, these things are only preachy if they're not relevant to the plot. For The Pius Trilogy﻿, I made sure that the motives of the bad guys were based around the faith, because their beliefs were antagonistic to "ours" (ours in this case is defined as the entire Judeo-Christian world) What we believe was and is a direct threat to their existence. From there, the books expanded around what we believed, explaining the enemy as "not-us." For example? Imagine if someone decided to declare war on Hobby Lobby instead of launching a lawsuit? Imagine if the L.G.B.T.Q.M.O.U.S.E. crowd gets smacked down for every legal action taken against a Christian minister who didn't want to perform a gay marriage, and in turn, they decide a wave of assassinations and church bombings. If you find that unbelievable, make the enemy China over the abortion issue, if someone tried to change them. You can preach, sure, but the characters will be spending most of their time trying to survive. Get the reader invested in the characters FIRST AND FOREMOST, and then you can do some preaching. Because if we care about the characters, we care about what they believe. It's almost as bad as those people who says that s/he is just a vehicle for the Holy Spirit, who is writing through him/her. Really? You're taking dictation now, people? Who are you? John Smith? Matt, Mark, Luke and John weren't even taking dictation! There's giving the glory to God, and then there's "my work is perfect with a divine stamp of approval." Indeed. Does God make the punctuation mistakes, too? Frankly, I think it's presumption to assume that everything coming out of one's word processor is "I'm writing for God!!!!" At best, I write from my gut, or my heart, and maybe my soul if I'm really on fire. But "God did it all!" removes: 1) God-given Free Will, 2) Any ability handed to them BY GOD. And 3) I think it denies God an ability to create a rational creature that can both act for itself while also seriving God. I believe it was Dorthy Lee Sayers who wrote the book "The Mind of the Maker." As she pointed out, the people we write are so alive, they can almost make their own choices, can you imagine what it's like for God? Now, I can see laying all the responsibility for the greatest of a book at God's feet by saying that He gave one talent and creativity and writing skills, and the friends and family who made the book possible, but saying that one just took dictation makes God look incapable of making a person who can take all of God's gifts and utilize them properly. If you've never heard of Anita Sarkeesian, well, your luck has run out. I've done a guest post discussing the little cuss over at a friend's blog, but I've been working on my own for a bit now. Anita has been very big on how video games and video gamers are misogynistic. I'm amused by how her arguments go. If you don't include female characters in your game you're sexist for excluding women. If you include female characters and they are designed as unattractive you're sexist for "denigrating women." If you include female characters and they are designed as attractive you're sexist for "sexualizing women". I'm generally wary of folk, like Sarkeesian, who have a vested interest in conflict. If complete gender/sexual equality were to be realized tomorrow, she'd have no purpose. I think she knows this, so making an honest effort to settle the issue doesn't do her any favors. Really, it seems like she's doing her best to play both sides off one another and keep it going, otherwise the interviews dry up. It's the behavior of a total putz, and I hope she stubs her toe at least once a day. Sadly, this is just another facet of that total Cluster Foxtrot over GamerGate. It's a political movement and a journalist corruption scandal rolled into one. Overall, it's totally stupid, and boils down to sneering at Gamers in order to defend against accusations of bias and fraud. Yeah, I know. Merry Christmas, right? I love Christmas. And I hate political hacks and biased schmucks from sucking the joy out of everything. I don't care if it's Anita Sakessian, Zoe Quinn or Al Sharpton. It's Christmas time, damnit. Can we stop putting up with these people for a few weeks? Please? In case you're wondering "Why are you doing yet ANOTHER music blog?" It's because I've been whacked by Jury Duty. Yay. Hopefully, updates are to follow. That's right. It's CHRISTMAS TIME. Or at least it will be when Cyber Monday is over.